This week’s lab is three experiments dealing with aldehydes and ketones. “Experiment” 22D is really just an exercise about the IR and NMR spectra of aldehydes and ketones, so I will cover it last (there are a few important peaks to know). Experiments 22C and 22E deal with two reactions that won’t be covered in lecture until later in the semester (the haloform reaction and the aldol condesation), so I’m going to go through them in detail. The carbon adjacent to a carbonyl is known as the alpha position. Because of resonance, hydrogens at the alpha position are fairly acidic (“alpha hydrogens” or “alpha protons”). Reacting a carbonyl with a base rips off an alpha-proton to form an enolate. Ketones and aldehydes form enolates very easily. Carbonyl alpha protons are acidic. You’ll learn much more about enolates in chapter 19 of Carey (8th edition; chapters 18 and 21 in the 7th edition). For now, just know that they are nucleophiles. They attack electrophiles to form new bonds at the alpha position. So in recap, you form enolates by adding a base to a carbonyl. Adding an electrophile (such as an alkyl halide) to an enolate then creates a new bond at the alpha position. What would happen if an enolate reacted with a halogen, such as bromine? The enolate would attack the bromine and create a new carbon-bromine bond at the alpha position. This is called alpha-bromination (or more generally, alpha-halogenation). When alpha-halogenation is carried out under basic conditions (NaOH), the alpha-halogenated product can react several times, until every alpha-hydrogen is replaced by a halogen. Alpha halogenation proceeds more than once under basic conditions. We can use this to our advantage to turn a methyl group (–CH3) into a better leaving group. Halogens are electronegative (an electron withdrawing group, or EWG), so replacing each proton on a methyl with a halogen stabilizes a negatively charged carbon atom. Halogens make methyl a better leaving group. Putting this all together, alpha-halogenation can be used to turn a methyl ketone into a carboxylic acid. First, the –CH3 on a methyl ketone is converted to a trihalomethyl group. This decent leaving group allows the carbonyl to undergo a nucleophilic acyl substitution reaction with the NaOH already present in the reaction. This is called the haloform reaction. Iodine can be used instead of bromine. Note that only -CX3 is a good enough leaving group to do this. and -CH2X or -CHX2 is too unstable to allow the carbonyl to undergo nucleophilic acyl substitution. Because of this, only methyl ketones can undergo the haloform reaction. Only methyl ketones can undergo the haloform reaction. Understanding the background and theory of the haloform reaction is most of the work for this experiment. You will mix together iodine, 2-butanone, and a 10% NaOH solution in a test tube. Because 2-butanone is a methyl ketone, it should undergo the haloform reaction and form triiodomethyl as a byproduct. Triiodomethyl is a yellow precipitate; when you see it form, you know the haloform reaction took place. The byproduct of the haloform reaction is a yellow precipitate. You’ll also run the same experiment on your unknown. If your unknown is a methyl ketone, the haloform reaction will take place and you’ll see the same yellow precipitate form. If you don’t see a yellow precipitate form, that means the haloform reaction didn’t take place so your unknown is not a methyl ketone. As I mentioned above, enolates are nucleophiles. Carbonyl groups are electrophiles. When you mix the two together, they can react and condense into one molecule. Adding base (such as NaOH) to an aldehyde or ketone will generate a little bit of enolate, which can reaction with another carbonyl molecule. This reaction is called the aldol condensation. The product contains a hydroxyl (–OH) group beta to the carbonyl, and so is called a beta-hydroxy carbonyl. Since this reaction is already taking place under basic conditions, if the reaction mixture is heated the beta-hydroxy carbonyl will undergo an E2 reaction to form a double bond between the alpha and beta positions. This product is referred to as an alpha, beta-unsaturated carbonyl. Once again, understanding the background and theory of the reaction (aldol condensation) is most of the work for this experiment. You will mix together 1 equivalent of acetone and 2 equivalents of benzaldehyde in a test tube with ethanol and a 10% NaOH solution. The acetone will react twice. Your product will precipitate out. 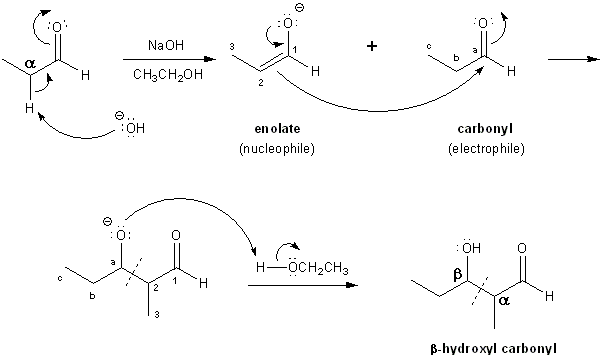 Enolates are formed when a base rips of a carbonyl’s alpha proton. If the a carbonyl has no alpha protons it cannot form an enolate! So there’s no change that benzaldehyde will ever attack the acetone; benzaldehyde is a non-enolizable carbonyl. Carbonyls without at least one alpha proton are non-enolizable. This “experiment” is really just asking you to identify key IR and NMR peaks for aldehydes and ketones. Aldehydes and ketones are both carbonyls, and so give a sharp IR peak around 1,700 cm-1. Aldehydes also give two distinct peaks around ~2,700 and ~2,800 cm-1. These peaks correspond to the carbonyl C-H stretch. Below is the IR spectrum of benzaldehyde. 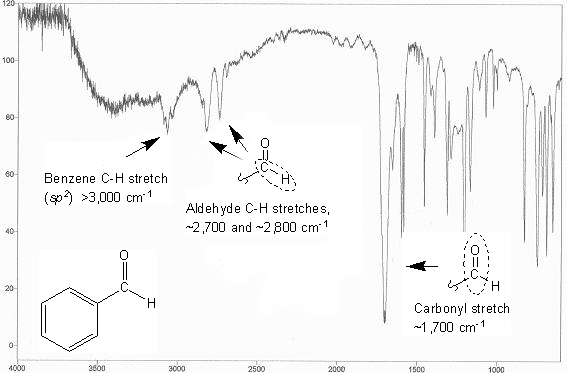 Notice that the C-H stretch for benzene is above 3,000 cm-1, and there are no C-H peaks below 3,000 cm-1 (except for the two aldehyde C-H peaks mentioned above). This is because only sp3 C-H peaks show up below 3,000 cm-1 on an IR; benzene only has sp2 carbons. I hope that helps for this week’s lab write-up.